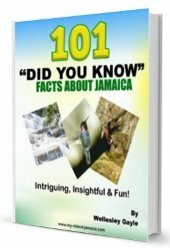 This fall is one of the most glorious falls located in Jamaica and is enjoyed all year round by both our visitors and locals alike. It is believed to contain therapeutic abilities due to its natural pools formed in the rocks which will be warm in some and cold in others. You enter the Park at a beach front covered in red colored sand with the water feeling cold as your feet enter the waters of the Caribbean sea but quickly warms to your body temperature. You look up and realize you are standing at the bottom of a 600-foot (180-meter) waterfall transcending down to you a series of vibrating sounds as the rush of the water cascades off the rocks and runs down to meet the waters at your feet. You are then greeted by a tour guide who welcomes you with outstretched hands for the climb of your life. The tour guides have mastered the art of climbing this beautiful & fun fall and welcomes passing on their knowledge and the wonderful experience to you. 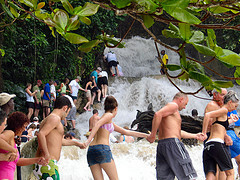 You are provided with special footwear (usually rubber shoes/slippers) and are led in a line holding hands up the falls by these guides who will tell you along the way of the different names given to different sections of the fall. Not only do they guide you up the falls but they are eagerly available to stop and snap pictures for you and allow you to take a plunge in the pools. Did you think the tour was over? Not at all! 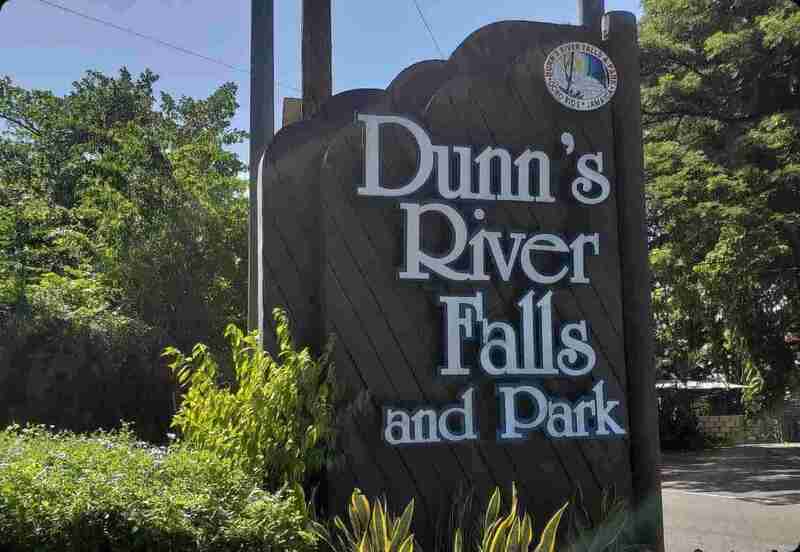 At the top of falls, you will be greeted by locals who relish in sharing with you their arts, trinkets and crafts made from local materials such as bamboo, grass and beads. After climbing the falls, you can freely bask in the sun on the beach at the bottom, while relaxing to the humming sounds of the fall running down to the ocean front and into the azure waters of the Caribbean Sea. 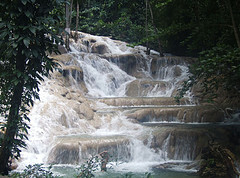 By the way, The Dunn’s River Falls is also the site of a scene filmed in the James Bond movie, “Dr. 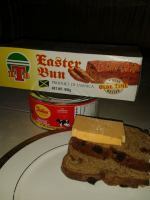 No”. 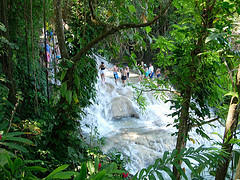 It is a definite must-see must-experience attraction in Jamaica.